FILE - Rwanda boasts the world's highest share of female members of parliament, at 64 percent. How long will it be before women earn the same pay as men for the same job? One hundred seventy years. Yes, you read that right: 170 years. That's how long it will take to achieve economic parity between the sexes, according to the World Economic Forum's Global Gender Report released Tuesday. The Geneva-based body pushed back its projection for economic parity between women and men by 53 years after finding that chronic imbalances in salaries and workforce representation had reversed the pace of progress since a peak in 2013. A new study of 144 countries found that measures of the overall gender gap — women's health, education, economic participation and opportunity, and political advancement compared with men's — improved in 68 nations, but worsened in 74. 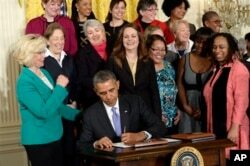 FILE - President Barack Obama signs executive actions, with pending Senate legislation, aimed at closing a compensation gender gap that favors men during an event in Washington marking Equal Pay Day, April 8, 2014. High-income countries showed the narrowest gender gaps, with Iceland, Finland, Norway and Sweden claiming the top four spots on the global ranking for gender equity. But the surprise was that Rwanda, a poor African nation, moved up to fifth place, with more women than men in its labor force and the world's highest share of female members of parliament, at 64 percent. Rwandan women earned 88 cents for every dollar men were paid for similar work, WEF said, making it the country with the highest-degree wage equality. Nicaragua displaced Switzerland for 10th place. The United States failed to crack the top 25, ranking a dismal 45th, a 17-point slide from last year. The United States, which looks set to elect its first female president, ranked 73rd in political empowerment, which measured the ratio of men to women in the highest levels of political decision-making. "In the political sphere, women's engagement in public life has a positive impact on inequality across society at large," the WEF report said. "In addition, there is a range of evidence to suggest that women's political leadership and wider economic participation are correlated."